Escape for three days of sailing and creating. Treat your eyes to scenic shorelines, lighthouses, bird watching. Treat your soul to the stillness of dawn. Let the inland sea (in this case, Lake Michigan's Green Bay) be your muse. 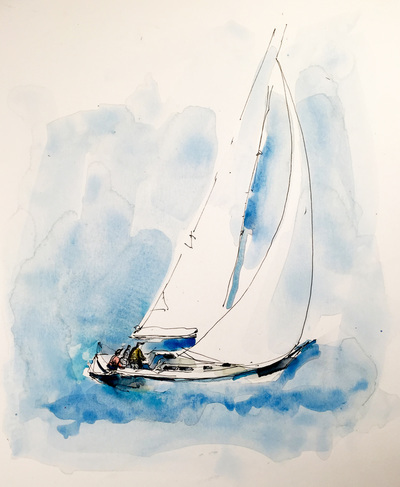 This Sea Scapes creative adventure is designed for those of all levels and disciplines (drawing, watercolor, collage, other non-solvent media.) Monica Fogg, relying on her decades of teaching and studio practice, will work with each person, based on individual goals. Whether just beginning or with an established practice, you will find support and inspiration. Days will include time a-sail, at anchor, and ashore. Your cozy studio will be an Islander 36 sailboat. 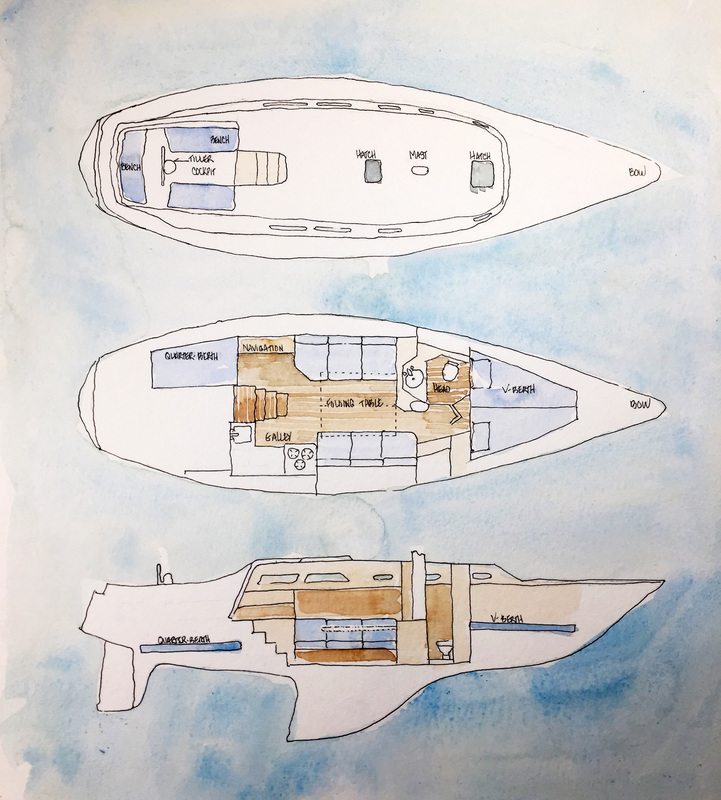 Sketch or watercolor from the deck or from shore (when moored.) While sailing, there will be time for reflection, meditation, sketching, writing, or engaging as a crew member. Would you like to steer for a while, absorbing the atmosphere of wind, water and sky from the tiller? For some, this workshop may be a time to experiment with art and be on the water. For others, it will be an opportunity to interpret with new perspective. We hope Sea Scapes will be inspirational for all and provide refreshing tranquility. We will sail and explore shorelines on Lake Michigan, specifically Green Bay. Depending on winds, we may explore Chambers Island, Horseshoe Island, the Strawberry Islands, or Door County’s Peninsula State Park. We embark from the Great Lakes Memorial Marina in Menominee, Michigan. This is where Michigan’s Upper Peninsula, Northeastern Wisconsin and Lake Michigan meet, just north of Marinette, Wisconsin. Named after a Native American tribe known as the Menominee (roughly translated as “wild rice”), the town was once responsible for more lumber production than any other city in the united States. What remains is the charm and character of restored 19th and 20th century buildings. Driving, it is (roughly) 5 hours from Minneapolis, 4.5 hours from Chicago, 2.75 hours from Milwaukee. Does NOT include: transportation to the marina, upgraded art supplies (see Supply List), or food. Thursday evening: Welcome aboard, Boarding 4-9pm, drop duffel + sleeping bag, bunks assigned, dinner ashore on your own. Sleep aboard. Friday: Breakfast ashore, sailing*, creative time, personal instruction. Lunch aboard. Return to slip in Great Lakes Memorial Marina (showers, etc.) Dinner ashore. Sleep aboard. Saturday: Breakfast ashore or aboard, creative time, personal instruction, sailing* to an evening destination, anchor off shore for the night. Lunch aboard. Dinner ashore or aboard. Sleep aboard. Sunday: Breakfast aboard. Creative activities. Return sail to home marina. Debarkation mid-afternoon. Captain Jim Herbert has been sailing for 50 years and holds a U.S. Coast Guard Charter Captains License. He has five years experience as a professional mariner working on Dredges, Buoy Tenders, Marine Construction Vessels, Supply Boats and Towboats. Additionally, he spent a year on the tall ship Regina Maris sailing across the Pacific to French Polynesia, Hawaii and back. As Organizer and Owner of Minnesota Sailing Alliance LLC, Captain Jim has taken many hundreds of people out sailing over the past eight years. 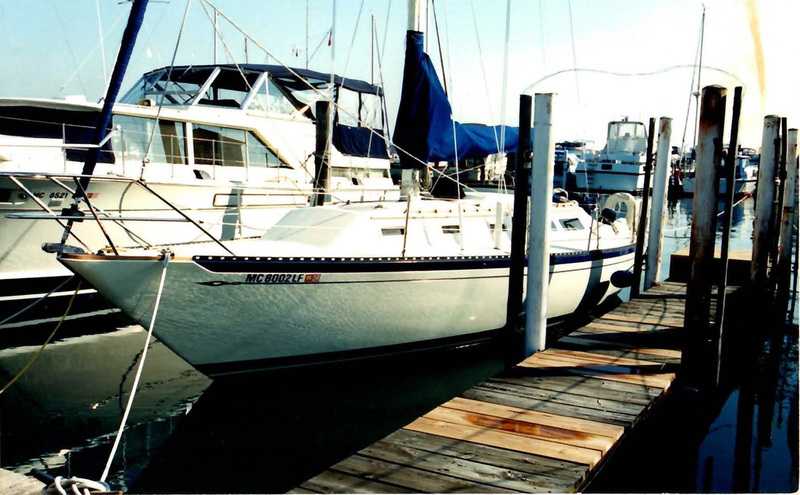 The Sandpiper is an Islander 36 (36’ long, sleeps six). For experienced sailors, she seems spacious. For others, it will seem intimate. Interior space includes: main cabin (navigation station, dining area, galley, sleeping benches for three), head (toilet and sink), V-berth (sleeps two), quarter berth (sleeps one). Exterior space includes comfortable cockpit, table and spacious deck.